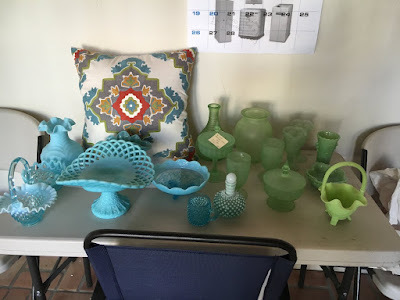 Thanks to all of the cute little antique shops in a nearby hill country town, I've got a good start on a collection of depression era glass to give the open shelving in the new built-in banquette of punch of color. And there's the pillow that started it all. The red is the current saltillo tile in the home. No more playing up that, for sure. I love the rest of the pillow... the greige, blue, green, gold and creamy white. That's the palette for every room in the house, with the exception of the sophomore's bedroom. As of right now, she's wanting grey and blush with copper accents.